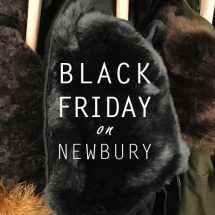 Newbury Street retailers are ready to welcome you on the biggest shopping day of the year — check back here often for even more deals and steals! *Exclusions may apply. See store for details. *3 New client special is valid for new clients only. Class packs expire 1 year from purchase date. Buy More Save More Event – Spend $100 save 10%, spend $200 save 20% and spend $300 save 25%. All purchases over $200 will receive a Marimekko Logo Tote free! *Valid only on full price merchandise, cannot be combined with any other offers. One GWP Logo Tote to a customer while supplies last. Take 25% – 50% off store wide, Friday, Saturday, & Sunday. *Sale excludes Chanel, Louis Vuitton, & Hermès. *A few select styles excluded. Extra 20% off your entire purchase.